I was walking through the drizzle that made Sheffield city centre look even more grey than usual and was feeling somewhat morose when I came across an amazing series of images. The Wild Planet photographs were displayed in the open air – each one a large and stunning image from different corners of the natural world. The image that entranced me was of seals on the skeleton coast – huddled as tiny dots at the foot of towering sand dunes. 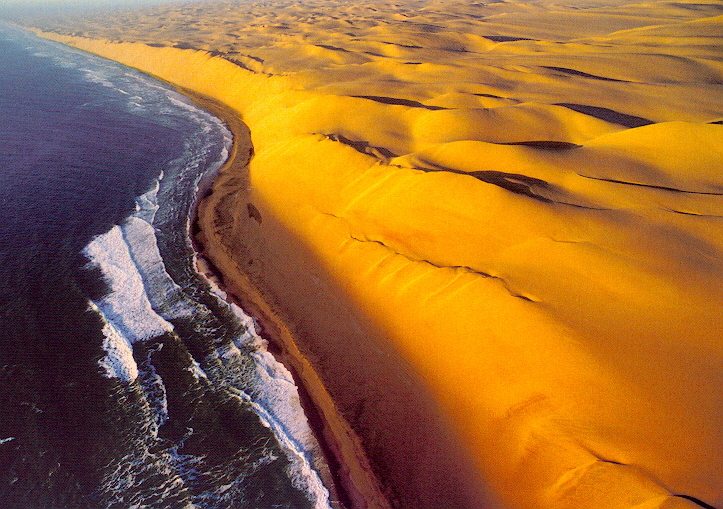 The Skeleton Coast is a 1,500km stretch of wilderness where the Namib Desert collides with the Atlantic Ocean. The Bushmen of Namibia call it ‘the Land God Made in Anger’. Standing in front of that image in the midst of the mundane and monotone city filled me with awe. Awe stirs into life in the pit of my stomach when confronted with these vast empty spaces. When I have stood at the edge of the Sahara in a dusty sunrise or looked across the Arctic Ocean with the midnight sun nudging the horizon; to see the tracts of sand or ocean, nothing upon nothing upon nothing, the beauty strikes me so deeply. The same feeling of joy and dread twists in our souls when we see the sky on a clear night, or look into someone’s eyes and see the infinite depth and mystery of another human being. Awe is, I think, the kernel from which our spiritual lives grow. It would be impossible to live in constant awe – each moment dumbfounded by the immensity of existence. I guess our minds have evolved in such a way as to block out or limit, for the most part, any experience of awe that might creep up on us and distract us from focussing on what we need to do to survive; go to the supermarket, find a job to pay the rent, find company to relieve our loneliness and on and on. In certain moments the curtains pull back and awe breaks through but too much would probably drive us insane (As Douglas Adams writes with regards to his Total Perspective Vortex ‘If life is going to survive in a universe as infinitely vast as ours the one thing it cannot afford to have is a sense of proportion’). What should we do with that sense of awe – whether it comes from the deep experience of meditation or seeing a reflection of the big bang in the Large Hadron Collider? To still our minds and truly experience existence in all its wonder is a worthy end in itself and will transform our perspective on the world. Even on a grey day in Sheffield we can still experience wonder if we stop to see deeply. But I don’t want to simply stay there – with my mouth agape and every neuron firing, the universe ablaze – what the subsequent step might be I will explore in the next post.